With so many amazing cities around the world, it’s often hard to choose where to go. Barcelona is one of the most visited cities in the world and it’s no wonder. With amazing architecture, culture, food and beaches, this is why you should visit Barcelona. For those that aren’t familiar with the Spanish culture, it is one that enjoys a laidback lifestyle, with lots of amazing food, drinks and quality time spent in the sun. Barcelona is an unbeatable city, with a great food, art, and history scene, plus it’s right on the Mediterranean. It’s one of the most visited cities in the world and it’s easy to see why with a stroll around the beautiful architecture, amazing history and beaches. It has also quickly become a tech/startup hub as well though and is a great place to get work done, and make great connections. The province is Catalonia so both Catalan and Spanish are spoken in Barcelona, although most everyone speaks English too. 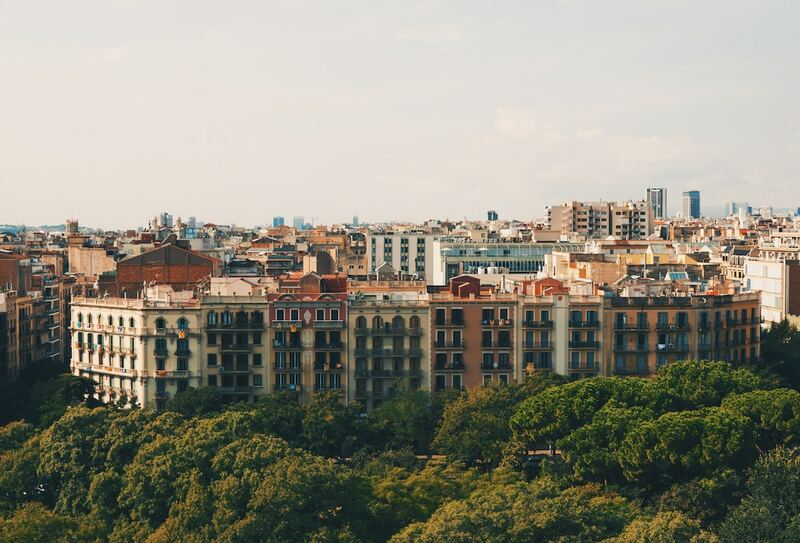 Barcelona is one of the best places to start your work and travel adventures as well as it’s a large city with all you need, plus a great place to network. With a great climate year round, and 320 days of sunshine on average, this city is fantastic any time of year. The crowds gather in the summer months (July and August especially) so if you prefer to visit when it’s less busy, the shoulder season (March – June) and (September – December) are recommended. Spain takes their cuisine very seriously and there are many restaurants in Barcelona with Michelin stars. Don’t worry if fine dining isn’t your thing though as Barcelona has restaurants of all kinds. Spain is known for tapas and sangria but there’s so much more than that. Head to less touristy spots, not right on the main drag, for a much better meal (and price). We recommend Tantarantana for tapas in El Born, La Cala Barceloneta in Barceloneta for breakfast / coffee by the sea, and Can Ros for authentic paella in the old fishing village of Barceloneta. There are so many restaurants to choose from though, we shared a list of more of our favorites here. We always recommend living in the seaside neighborhood of Barceloneta as you are just a minute or two walk to the beach, and a close walk to the centre of town. The old city, Ciutat Vella and Eixample neighborhoods are great places to wander, shop and pop in for a bite or drink. Gracia is also a fantastic neighborhood to wander in, with great restaurants and large squares full of people eating and drinking in the sun. Barcelona has a very large expat community with people from all over the Europe and the world desiring to call it home thanks to it’s fantastic climate. There is always different meetups and events going on, and truly something for everyone. You can also check out what’s happening and when by visiting TimeOut for the weekly happenings. Being based in a great hub like Barcelona you have cheap flights to all over Europe, and Morocco (sometimes for as little as $2/flight!). It’s quick and cheap to hop over to Italy or Germany for the weekend. If you’re looking for something a little closer to home, head up the coast by train and beach hop, or take the train into Southern France and visit the charming town of Collioure. A high speed train will get you to the countries capital, Madrid in two hours, or you can rent a car (or take a BlaBlaCar) anywhere that isn’t on the train lines for cheap. A more touristy adventure near Barcelona is a trip to Montserrat – we recommend taking the train there and then opting to hike rather than take the funicular to the top. You’ll get some exercise and see some amazing views. If you’re into hiking there are hundreds of amazing spots just a quick train or car ride away from Barcelona. Visiting a winery or taking a cooking class is something people often want to do while in Barcelona, our team can recommend some places if that’s you. The city really has something for everyone, with fantastic food, art, history, shopping, beaches and more – it’s no wonder our founder, Meesen, is based here. To book your trip to Barcelona, get started below!